There are two ways to deploy your custom composed look. 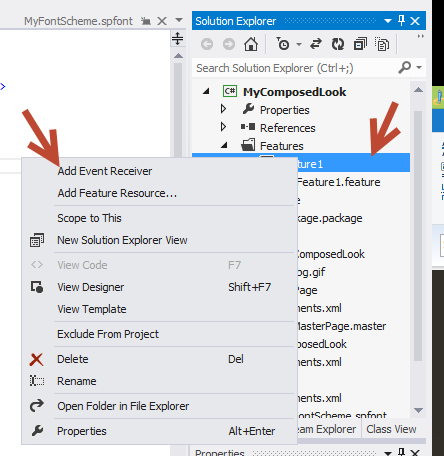 Via XML / Elements file – the declarative way, or via feature receiver / C# the imperative way. This article will cover both methods, it’s up to you to ultimately decide which way you prefer. 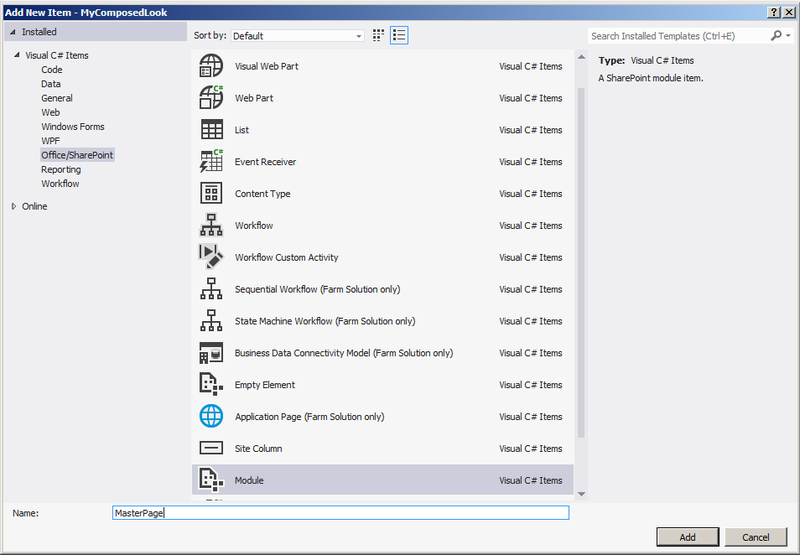 First I will explain how to put together the the Visual Studio 2012 project with the assets for the composed look. 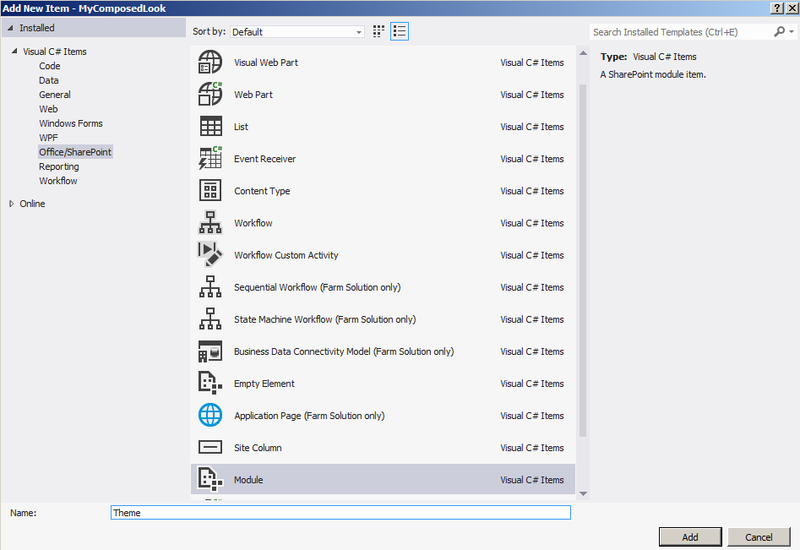 If you already know how to deploy these assets or they already exist in SharePoint skip down to the bottom. 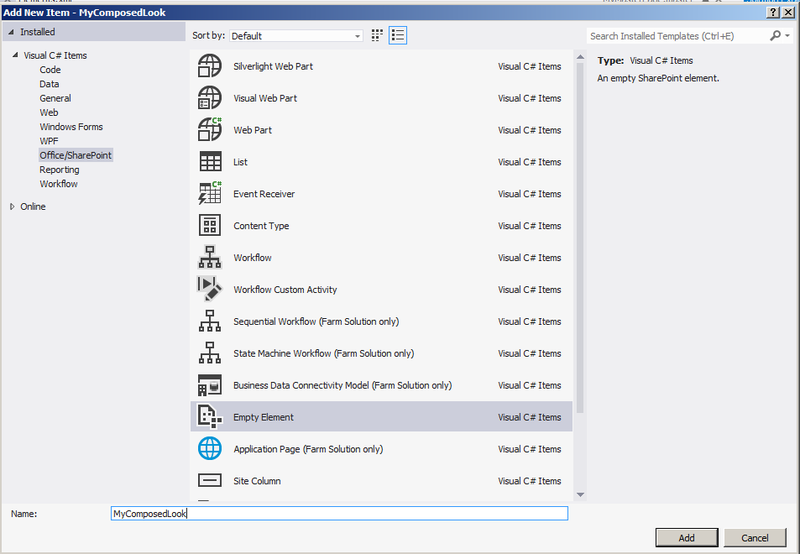 Starting with an empty SharePoint Project – farm solution. First we need to add 4 things which are used by the Composed Look. Edit the elements file, make it look like this. Make sure to match up the MasterPageUrl, ThemeUrl, ImageUrl, FontSchemeUrl. Description="Use this list to store composed looks. These looks can be applied to this site by navigating to Site Settings and choosing Change the look." Double click on your feature, and ensure that the MasterPage & Theme are included in the feature. 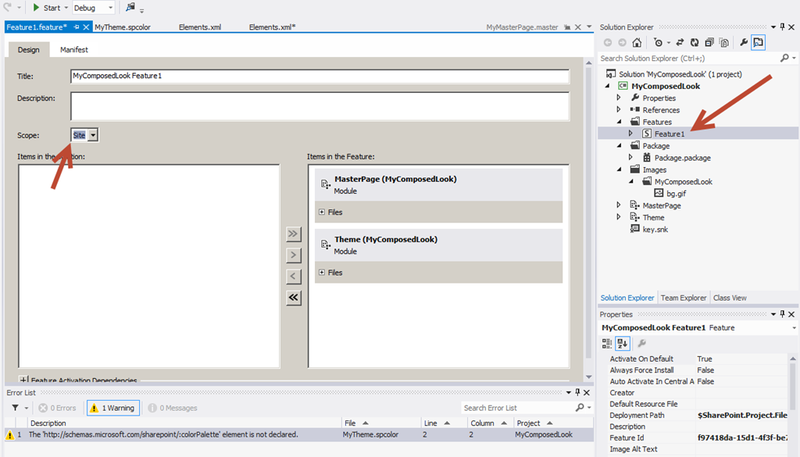 If your using the declarative method for the Composed Look then make sure the MyComposedLook Element is in the feature. If your using the imperative method then your feature receiver will do the work when activated. Reallu a great post. I was struggling with the creation of a Composed look declarative. Your “Adding a Composed Look – the Declarative Method” section was very handy. 1. You scope the composed look to site (site collection) level. So, Is it possible to apply this composed look to all sub-sites? 2. I had updated the master page code to hide the suitelinksbar. 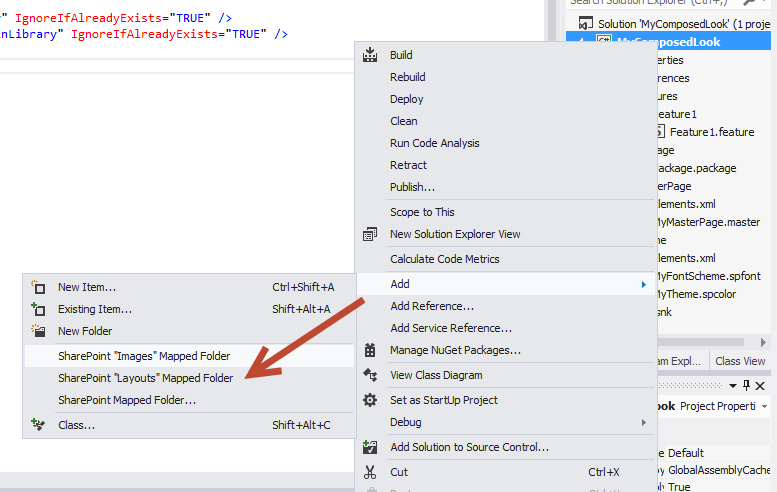 When this project is deployed, I notice that the masterpage, .spcolor gets added to the respective folders. Also the new colors get applied to the site. However, the suitelinks bar is not hidden. Then, I went to designer –> masterpage and set the new masterpage as default. Now the suitelinksbar is hidden. 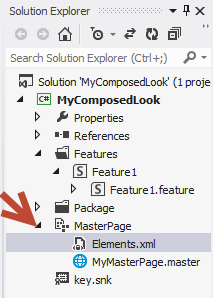 My question is, in case we use composed looks in SharePoint 2013, then, we are already specifying the masterpage URL in the feature activated event receiver, and then programatically applying the theme. 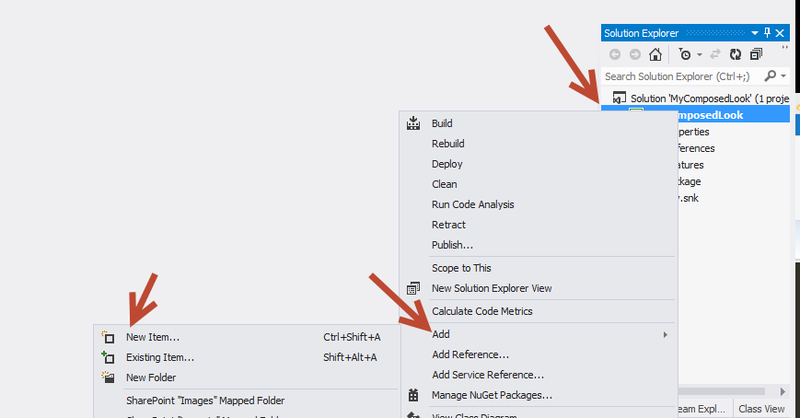 Is it then necessary to also write the code to set the new masterpage as default in the activated part of feature event receiver? 1. Yes you can apply to all sub-sites using feature receiver code. One way to do this would be to get the root web url and on the subsite point it back to that location. Below is pseudo code (I haven’t checked it). I used something like this but this is not exact. 2. 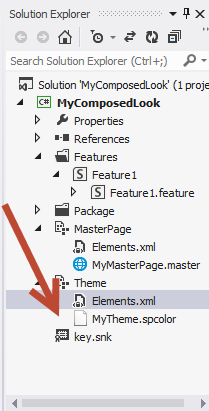 You can update the composed look xml to use your developed masterpage. One thing to note is if you want to be able to select your composed look through the ui then you need to also have a .preview for your masterpage. I would just copy the seattle.preview and rename it, unless you want to make your own special one. I follow the above method and after deploying I navigate to the master page gallery. It gave me the error: “file not found”. Besides that, the master page is not visible in designer. Any help? If the file is not there then potentially the module used to deploy it is not 100% accurate, or the path / url may be invalid or wrong. Going to that location vs Master Pages on the left navigation is totally different because it’s filtering on properties of the files. Thanks for your guide. However I do have one question. To set the look-and-feel I could use this code in the event receiver. But how do I specify one master page as the system master page (i.e. seattle.master) and another one as a site master page (i.e. mycustom.master). I do not want the site master page to be used on for instance site settings and pages like that. I would like to set this programmatically and not through the GUI. this is line sets the Theme in a 2010 site. Thank you. I think the problem was that I forgot the web.Update() in my event receiver as you mentioned… I am using the following powershell snippet to solve this now. Still having one problem though. The masterpage only applies to pages within the page library and not the one’s in site pages. This might be “by design” but is it possible to apply masterpage to those pages as well? The system master page is used for all web part pages, forms, list views, wikis, admin pages. Anything contained in “Site Pages” are web part pages. so to get full coverage you would have to apply it to both. Thank you for following up. Perhaps in the future it will be possible to set this up master pages with a higher granularity in a composed-look. 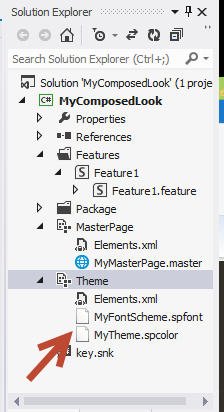 As for now I will have to create a master-page that works both for the custom-looks-pages as well as settings, dialog and list pages etc..
does the Declarative Method set the composed look when create a new sub site from a solution. nothing sets the composed look automatically on a sub site unless it’s a publishing sub site. There is a way to do it using an web provisioned event receiver. I have a problem. 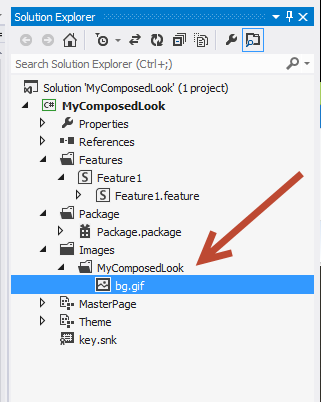 Your script for adding a “composed look” work, but the new “composed look” do not appear in Design Gallery. I’m use the Imperative Method, do you have the same behaviour ? or your composed look appear in list of composed look and in design gallery ? I found it! the spfont and spcolor files must be at the root of “/ _catalogs/theme/15 /” should not create additional directory for your custom spfont or spcolor ! In your opinion, is this a Sharepoint bug (another ;))? Interesting findings, I’ll try that out in my environment to verify. Error occurred in deployment step ‘Activate Features’: List ‘Cs Look’ does not exist at site with URL ‘http://uichdbss06’. Which method are you using to add the look? code or xml. In your composed looks elements.xml you used absolute paths to the files, it is better to just use server relative paths. Hi, thanks for the feedback. Yes you are should use relative paths if you plan to deploy to other site collections. Otherwise it may not work properly.